Modi’s Hindutva defined by Guj CM Vijay Rupani. BJP’s Hindutva is an useful tool to achieve its political goal towards ‘development for all’ with ‘appeasing none’. Hindutva not appeasement, it is development, says Gujarat CM Vijay Rupani. Chintan Acharya| DNA Online | Ahmadabad | Nov 8, 2017:: Gujarat Chief Minister Vijay Rupani believes that the fact that he has come up the hard way is the reason he hasn’t faced any personal or political allegations during his term at the helm of the state. Rupani said that he was given the formula of a transparent, decisive, sensitive and progressive government when he took over, and he has tried to adhere to it. He pointed out that he stayed put in Banaskantha for five days straight to oversee flood relief, showing the government’s sensitivity to people’s problems. Even as the BJP faces challenges in the upcoming Assembly elections owing to unrest among various communities — depicted by the agitations being led by Hardik Patel, Alpesh Thakor and Jignesh Mevani — Rupani claimed that none of the communities were against BJP. “The three leaders you are talking about are Congress props,” he said. “Their agendas and issues were aimed at elections. Once the polls are over, and Congress bites the dust again, these agitations and their leaders will disappear on their own.” He added that the trio was not working for any community, but for personal gain and political interests. It is widely believed that Rupani’s predecessor, Anandiben Patel, resigned due to ineffective handling of the Patidar reservation agitation. However, Rupani did not have to face many issues on this front, barring during the past few months. Incidentally, while Rahul Gandhi has been visiting a number of temples during his visits to the state, dubbed soft Hindutva by many, BJP seems to be silent on its favourite Hindutva agenda. Reiterating that his party’s sole agenda in the elections is development, Rupani said that BJP had won a thumping majority in Uttar Pradesh, and the same would happen in Gujarat. “Narendra-bhai’s mantra of development has been accepted by the country,” he stressed. While the selection of both BJP and Congress candidates is underway, Rupani recently announced publicly that he would contest from Rajkot West, the same seat he represents in the Assembly. He says the announcement was in reaction to the Congress’s false campaign that he is facing anti-incumbency. “I firmly state that I will contest from the same seat, and there is nothing like anti-incumbency against me. I have the support of voters in my seat,” he said. Courtesy: Daily News & Analysis. 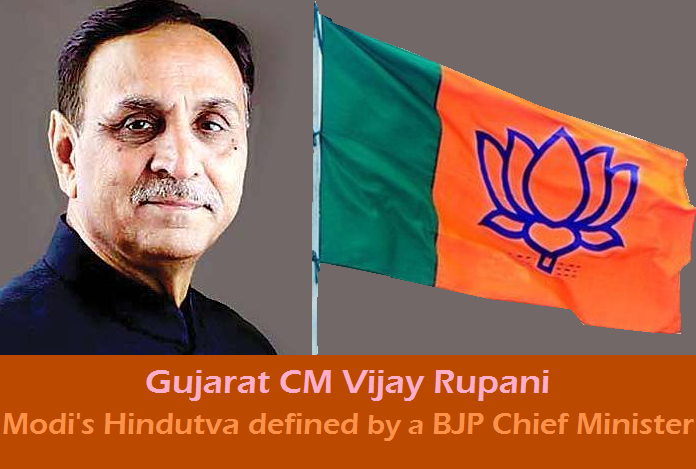 This entry was posted on November 8, 2017 by hinduexistence in Hindu Agenda, Hindu Development, Hindu Empowerment, Hindu Vote Bank, Hindutva and tagged Gujarat CM Vijay Rupani, Hindutva is is development, Hindutva not appeasement, Modi's Hindutva, Modi's Hindutva defined by Gujarat CM Vijay Rupani, PM Narendra Modi.